Libraries’ online presence is a constant topic of conversation, with anecdotal insights dominating the discussion. A broader picture of what libraries across the country – and throughout Colorado – are doing with web technologies and web 2.0 tools is a little harder to find. That’s where LRS stepped in with a paint brush. In spring 2010, LRS staff repeated its observational study (first conducted in 2008) of U.S. Public Libraries and the Use of Web Technologies. We visited the websites of 689 public libraries in the U.S., including all those in Colorado, to see what they were doing with their web presences. Our final report is now ready for your perusal, with some interesting findings related to the use of both older and newer web technologies, as well as the success of the libraries that have adopted these tools. For starters, take a look at libraries’ use of Facebook. It’s common knowledge that the social networking site is popular around the world, but just two years ago public libraries in the United States had hardly begun to investigate its potential as a way to reach their patrons. Now, 1 in 3 public libraries across the country (32%) have a Facebook account. 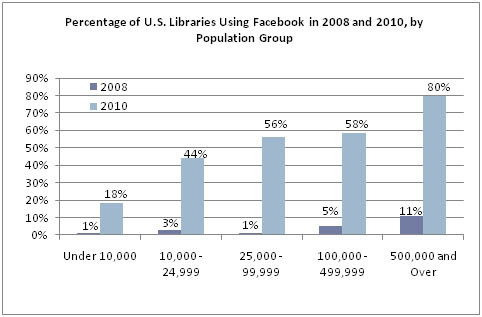 The chart below shows how much Facebook use has increased in libraries of all sizes since 2008. While social media sites have taken off in public libraries, adoption of other tools has slowed. Basic web services such as online account access showed little increase, as did email reference and blogs. 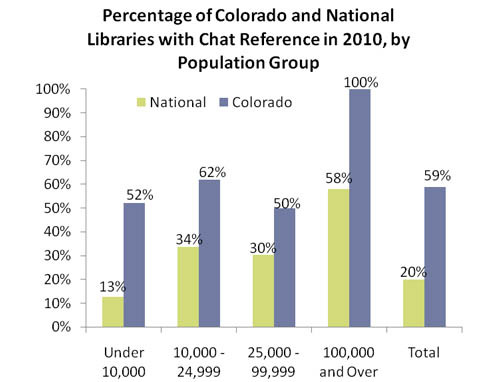 Chat reference is still the most popular virtual reference tool in Colorado, with a much higher percentage of libraries in the state than in the nation offering the service. It’s interesting to know what libraries are doing to enhance their web offerings, but do their efforts go unrewarded? Based on our analysis of “Early Adopters” – those libraries that scored in the top 20 percent of their population groups on our index of Web 2.0 technology adoption – libraries that were experimenting with these features reported higher numbers for traditional measures of library success, such as visits and circulation (see the chart below). This was true for almost all inputs and outputs – everything from staffing and funding to reference questions and program attendance. Yes, it is true that overall, Early Adopters enjoyed more resources—human and financial—than non-early adopters, which logically makes it easier for them to invest in more and newer web technologies. But even when controlling for staff and collection expenditures, Early Adopter status was still a significant predictor of higher visits, circulation, and program attendance. 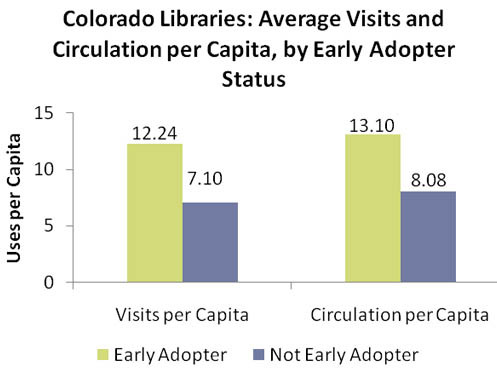 Furthermore, libraries that were Early Adopters in the first study experienced greater increases than non-early adopters in visits and circulation between 2008 and 2010. Check out the full report for more details on what libraries are up to with their websites and online presences: U.S. Public Libraries and the Use of Web Technologies, 2010. Coming soon is a brief Fast Facts highlighting the Colorado results. Questions or comments? We’d love to hear them!